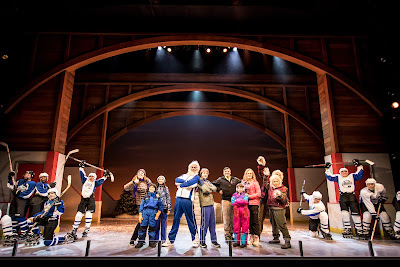 The story centers on the Munson family - middling middle school hockey player Mitch (an appealing Henry Constable), his stereotypically obsessive and hovering hockey parents (played expertly by real-life married couple and CTC company members Autumn Ness and Reed Sigmund), and younger sisters Tracy, herself a pretty good hockey player (the always entertaining Natalie Tran), and Lily, the princess of everything not hockey, who often feels overlooked in this hockey-obsessed family (a shining and adorable Valerie Wick). The drama enters into the story when Mitch loses his A team place to a yeti named Harry (a towering yet charmingly childlike Ryan Colbert) who was adopted* into a human family of overachiever mountain-climber parents (a fantastically preening Bradley Greenwald and Elise Benson) and a perfectly average younger brother Freddy (the also adorable Alejandro Vega). You see, Harry is a hominid, and the official Hockey Rules allow for hominid or hominoid like creatures to play. 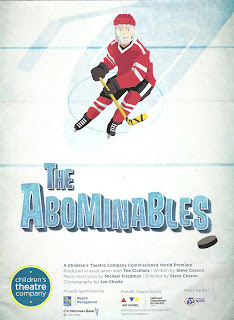 This sends the Munsons scurrying and turns Mitch into kind of a jerk as he ignores his B teammates and plants seeds of doubt in Harry's head, a big sweet yeti kid who just wants to play hockey and have friends. The parents also fight, but forgotten younger siblings Lily and Freddy become fast friends (I'd gladly watch the Lily and Freddy spin-off, so sweet and pure are these youngsters). But in the end, lessons are learned by all and Mitch and Harry become friends too. Because sometimes losing is just as important as winning, and things that you can lose are the most precious things of all (this is where the tears come in for the grown-ups). 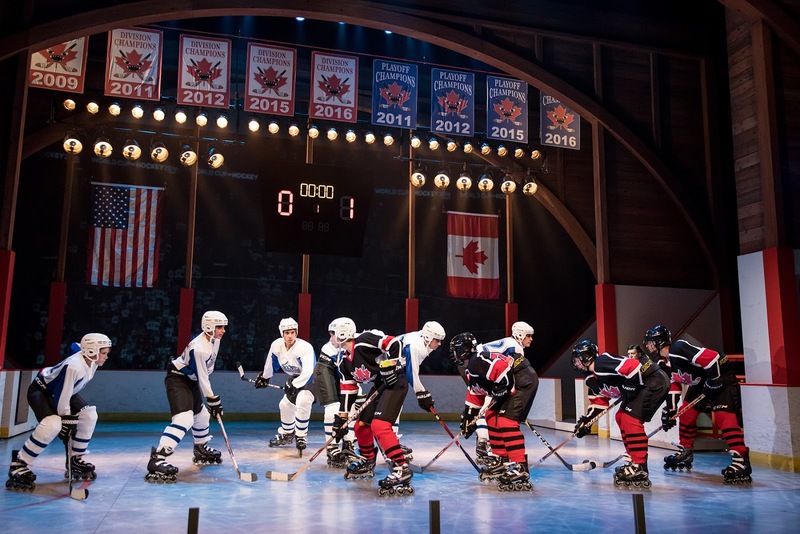 This is a hockey musical, so there has to be skating. 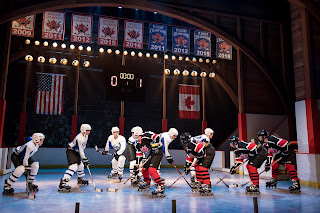 The stage at CTC has been turned into a realistic looking and very detailed hockey rink by scenic designer Andrew Boyce (learn more about that in my "sneak peek" post), and much of the ensemble is on roller blades for much of the show. Having been cast early this spring, the kids have been practicing their skating all summer and look like naturals. Choreographer Joe Chvala and fight/hockey choreographer (hockey choreographer?!) Ryan Bourque have them moving around the space effortlessly, slapping their sticks, and performing a bit of fast foot dancing off skates too. Skating is so fast, and it's thrilling to watch them whiz across the space. 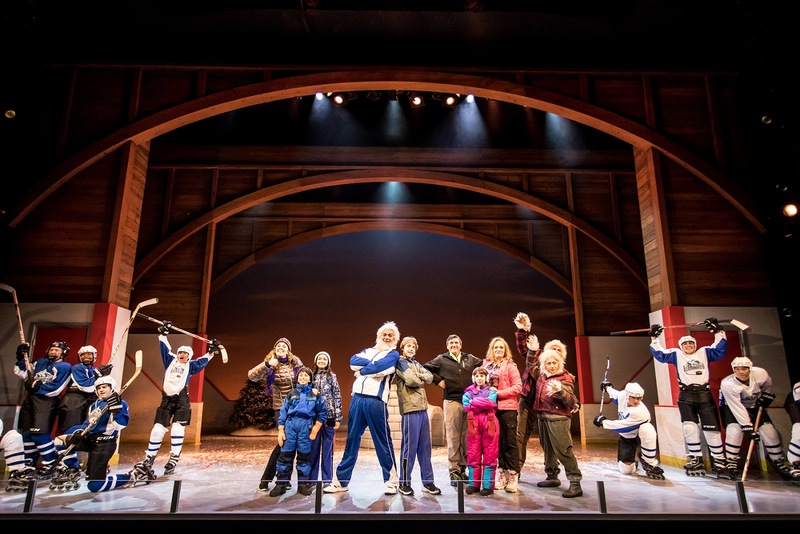 The costumes (designed by Jessica Pabst) may be less fantastical than a Dr. Seuss show, but include full hockey gear and practical character-specific Minnesota clothes, plus the furry yeti. Highlights in the fun, clever, catchy score include a song about Minnesota nice (and what's boiling just underneath it), a togetherness song "We are All Yeti," and the finale about how losing can be winning and winning can be losing. That last song about "learn to lose" takes on an extra poignancy because the world just lost composer/lyricist Michael Friedman, who created this piece along with playwright/director Steve Cosson. 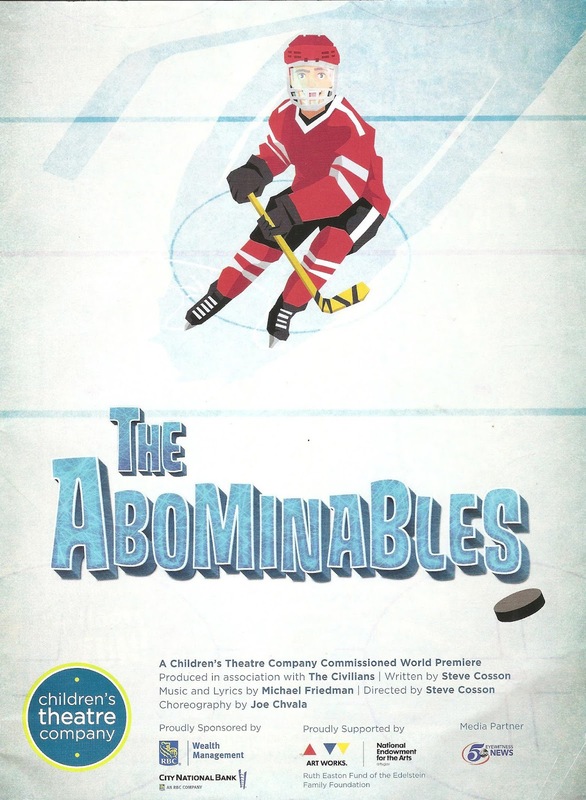 He died from AIDS at the age of 41, just a few days before previews of The Abominables began (you can read some really lovely things that his friends and collaborators wrote about him here). I'm at a loss how to put that into context here, other than to say he left a world of music behind, and took with him a world of music we'll never get to hear. We hope that, no matter what your child's "thing" is... you'll recognize the complicated, beautiful mash-up of commitment and love, failure and opportunity, that is at the center of any worthwhile pursuit and at the heart of being a family. *Please click here to read the Pioneer Press article about audience reaction to the show around the treatment of adoption, and the Children's Theatre's response.